TORONTO, ON – Minhas Creek Brewing entered the Ontario market for this first time this week with the launch of Boxer Lager at Beer Store locations across the province. Minhas Creek and sibling company, Mountain Crest Brewing, operate out of Alberta, Saskatchewan and Manitoba, with brewing facilities in Monroe, Wisconsin. They market a variety of brands in Western Canada and some US regions, with discount and budget brands being their main focus in Canada. 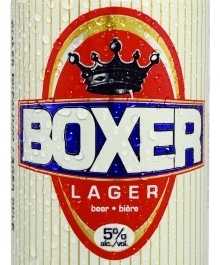 Boxer Lager is made with Western Canadian 2-row barley malted in Biggar, Saskatchewan, and is described as a “unique maltier-tasting beer that is preferred by most Canadians”. It’s available in 12 packs of 355 ml cans for $15.80 including taxes and deposit, the lowest legal price for beer in Ontario. I am going to pick up some tonight after work. Used to live in Calgary and followed your story to success, with good parenting from your Father. The last story I read then was that you were coming to Ontario. I for one was astonished they re-ordered the three R’s of recycling from reduce, reuse, recycle to reduce, recycle, reuse. Bashing reusable beer bottles and claiming recycling the cans is superior is corporate greenwashing at the very least. Unlike the ads say, boxer isn’t available in 24 can cartons/boxes so I wasn’t able to gat the “free” beer; I bought a 12 pack. “tis a pity they aren’t sold singly. I now have 11 boxer lager. I have one question: how did they ferment water ? I find their tv ads here in Ontario very objectionable. The claim that the use of aluminium cans is better for the environment is untrue and the disparaging of re-using glass bottles is an astonishing advertising tactic.